What is the greatest obstacle to meditation? When I ask this question of students in my classes, I usually hear one of two things: “I don’t have the time to meditate” or “My mind is just too active to meditate.” Notice that both of these relate to being too busy: either my life is too busy or my mind is too busy. In any case, let’s consider each of these separately, starting with the time issue. I empathize with anyone with a busy life. But is a busy schedule really a good reason not to meditate? As Mahatma Gandhi is reported to have said, “I have so much to accomplish today that I must meditate for two hours instead of one.” He makes a good point. Just consider how important your mind is to the quality of your life. Your mind is the filter through which you experience everything. The quality of every experience, of every moment of your life, is colored by the quality of your thinking, of your awareness. If you are well rested, relaxed, clear, creative, happy, peaceful, you’re going to enjoy your life a whole lot more and achieve a whole lot more. If your productivity and the quality of your entire experience of life can be improved by spending a few minutes a day meditating, isn’t that a good investment of time? Meditation pays back that time with megadividends and improves your health and vitality as well. So the fact is, the busier you are, the more important it is to meditate. You just need to put the quality of life, creativity, and productivity at the top of your daily to-do list. Now, what of the “my mind is too busy to meditate” issue? Everyone’s mind is incredibly busy. We all have lots of thoughts; estimates range from thirty thousand to eighty thousand thoughts each day. Whatever the actual number, it’s a lot. Yet a busy mind is not an obstacle to meditation. 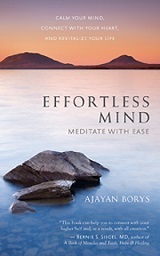 As a wonderful teacher of mine, Mata Amritananda Mayi (Amma, “the hugging saint”), once said, “To say that only those with quiet minds can meditate is like saying that only those with perfect health can go to the doctor.” Those with busy minds are the ones who need meditation the most. That’s all of us! Having lots of thoughts does not pose an obstacle to meditation, but the idea that you shouldn’t have thoughts in meditation does. In fact, this can be a huge obstacle to meditation. This idea will pit you against your own mind, because it will make you try to suppress your thoughts. That is, you’ll break the first essential principle of sublime ease. Besides, the battle against thoughts is a battle you just can’t win. The very nature of your mind is to think; that’s what a mind does. If you pit yourself against the nature of your mind to think, there will be a loser, and it will be you! Here is an experiment you can try in order to see this for yourself. See if you can control your mind. Pick something — anything at all — to focus on, and try to focus exclusively on that without any thoughts interrupting your focus for a minute, or even for just fifteen seconds. Seriously, give it a try…. How did you do? Interesting how, the moment you try to focus, other thoughts crowd in. It’s almost like magic. The mind’s very nature is opposed to control; just like you, your mind wants to be free. So let it. Don’t oppose your mind; work with it. That’s the Tao of meditation. We don’t control the mind, and yet the mind does quiet down. The mind becomes controlled, but not by you or me; rather — and this is a great secret of meditation — the mind can be effortlessly controlled by its own nature. I would go so far as to say that this pull toward perceived happiness is to the mind what the law of gravity is to physical objects — it is that powerful a force within us, invisibly driving humanity in all its endeavors. The good news is that when it comes to meditation, this powerful force is not an obstacle. Yes, those who try to control the mind will find its restless search for happiness to be an obstacle. For them the mind will be like a monkey jumping wildly from limb to limb. Yet as my first teacher, Maharishi Mahesh Yogi, used to say, the mind is not a wild monkey at all, but a bumblebee going from flower to flower in search of nectar. Once we understand this, we can simply point the mind in the direction of that nectar of greater happiness instead of trying to forcibly control it. The mind’s own nature will begin to work for us instead of against us. This is the great secret of effortless meditation. So, where is greater happiness for the mind? Simply put, it is in transcending to subtler levels of the mind. Once you approach meditation with ease, you will discover the great charm that lies within, in the inner peace, stillness, expansiveness, intelligence, and creativity at the quieter levels of awareness. Once you stop trying to control it, your mind will discover that the experience of its own depths is true nectar. Meditation is said to bring you to what in Sanskrit is called ananda, a state of bliss. You don’t need to force your mind to go to bliss; you need only point your mind in the right direction and let go, and the law of gravity of the mind — the draw toward greater happiness — will do the rest. This is why the Tao of meditation works best. This is the practical way to control the mind, not by any exertion. You will see just how to do this as we progress through the book. Every technique in this book is based on this principle. To better understand how thoughts can coincide with deep meditation, allow me to offer a final metaphor. Think of your mind as an ocean. Until now you’ve been hanging out on the surface of that ocean — the conscious thinking level — bouncing from one thought wave to the next, buffeted by desires, musings, worries, irritations, ambitions, insights, and so on. Once you start to meditate, you slip beneath the surface and begin to descend into the depths of your mind. As soon as you slip beneath the surface, you experience inner silence; and as you descend, the silence becomes deeper, richer, and filled with the light of being. Yet the waves on the surface will likely continue. The whole ocean does not have to become perfectly still for you to experience the inner silence of meditation. You can abide deep within, drawn by that increasing peace and well-being, while thoughts go by on the surface of your mind. And now and then you will rest on the ocean’s floor, where all is still.